Africa—with 54 states, more than 1,000 languages and the youngest population of the world—is multicoloured and multifaceted, age-old and modern. This diversity is rarely addressed in Europe’s narrative about the “dark continent”. 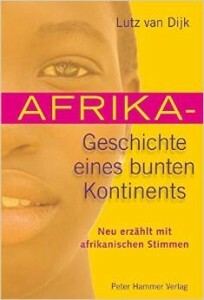 It clings to the fairy-tale of Africa’s lack of history and political insignificance with incredible tenacity. Current media portraits remain reduced to terrible and shocking political news and exotic folklore. Lutz van Dijk’s fascinating history of Africa—written foremost for young readers—wants to break with this approach and sheds light onto the continent’s innumerable facets. It begins with the genesis of this part of the Earth and the first humans that set out from here to travel into all corners of the world. It tells of the early advanced civilisations in the Islamic North and the Christian and traditionally African civilisations in the South, of life in the steppe and in the modern big cities. The author recounts the centuries of European colonialization as well as the liberation and finally sheds an explanatory light onto current topics such as Aids and Ebola, China’s new role, the “Arab Spring”, Boko Haram, flight and displacement. The greatest strength of this work lies in the fact that Africans themselves have their say: they tell of their lives and their hopes and ultimately render the image of Africa humane and animated—the most effective means against the stereotype of the dark continent!